Dallas Mayor Mike Rawlings at the first ever Mayor's Cup debate. High school debaters from across the Dallas school district took center stage at the first ever Mayor’s Cup contest Thursday night. They debated a topic that’s generated a lot of heated discussion in Texas in recent years: school vouchers. 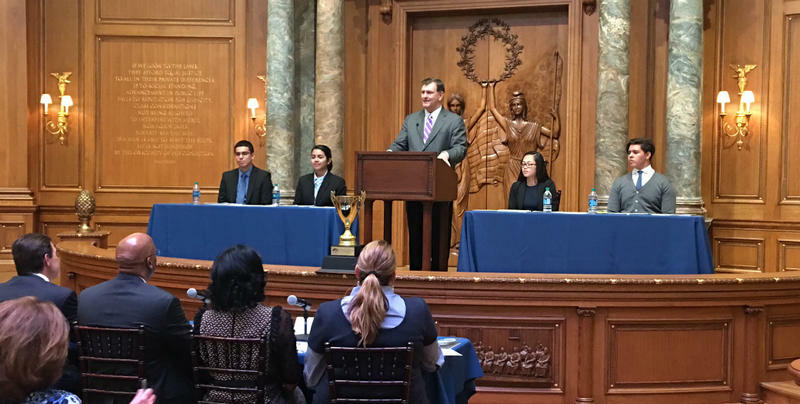 The competitors were members of the Dallas Urban Debate Alliance. The 10-year-old organization encourages Dallas ISD kids to get involved in competitive, academically rigorous debates. Victor Pena, a senior at Thomas Jefferson High, shared the victory with Kathy Nguyen, a North Dallas High junior. Pena said it wasn’t really about beating his opponents. Dallas Mayor Mike Rawlings encouraged Harlan Crow to host the contest at the state-of-the-art, wood-paneled, debate chamber in the Old Parkland Hospital campus that Crow renovated.